Not only was the filling unique, but her way of only filling half of the tortilla, then sliding it into the pan flat, THEN folding it over was totally new to me. I tried it, and I liked it ~ very much! 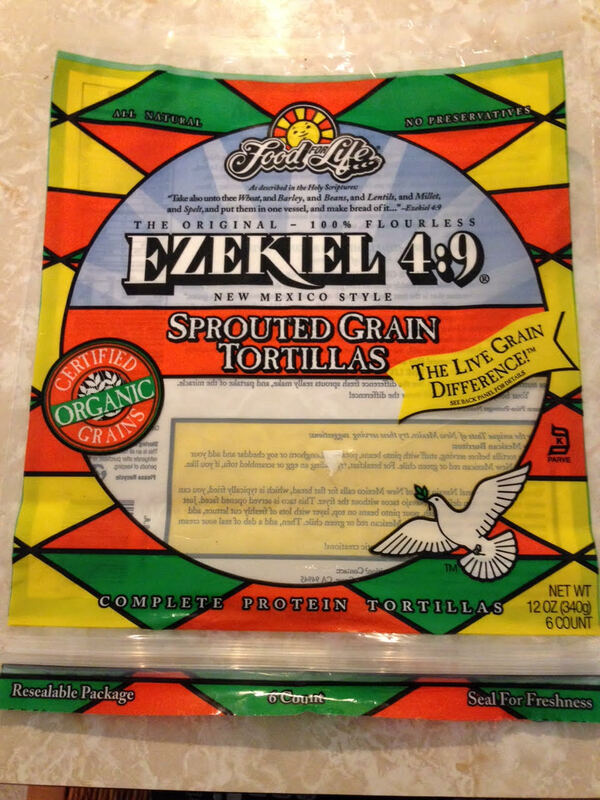 Especially because I chose to use Ezekiel wraps. They are one of the healthiest tortillas you can use. However, because they are flourless and made with sprouted grains, they aren’t as flexible as regular tortillas. They tend to crack when you fold them. Actually, they always crack when you fold them. With this technique of sliding them into the pan while flat, the whole tortilla gets a chance to get warm and softened from the heat and oil in the pan. So when folded in half, they don’t crack. Hallelujah! I made the “Eat at Home” recipe for dinner the first day, then the next day I made them for breakfast with eggs, tomatoes and spinach. Today was lunch with eggs, onion and bacon. We had quesadillas for 3 days in a row. Once for dinner, then breakfast, and finally lunch. Would you call that versatile? I do. Using scrambled eggs for a filling item was my first thought. But scrambled eggs are bulky and don’t lend themselves to a nicely filled quesadilla. I used my largest 12″ skillet. First, pre-heat the skillet on medium-high heat. Then add 2 teaspoons of coconut oil and turn the heat down to medium. Have your tortilla wraps ready with any other filling items on the side. While your pan and oil are getting hot, whisk 2 eggs with one teaspoon water, a pinch of sea salt, and whatever seasoning mix you like, or even just a pinch of pepper is good. Whisk those eggs up good. When your oil is hot, but NOT smoking (that’s too hot), pour in the eggs and let them flow all over the bottom of your skillet. Turn the heat down again to medium-low. You’ll need a large spatula to flip your big flat egg thingy when it’s set on the bottom. When you flip it, tilt your pan up to meet it. That helps. Do your best and don’t beat yourself up if it isn’t perfect. It’s all going into the tortilla anyway. The tortilla hides a multitude of food-prep sins. After flipping the eggs, turn off the heat. There’s enough residual heat in your pan to cook your eggs. Once they’re set on the second side, about one minute, use your spatula to slide your big flat egg thingy onto a tortilla. Add one teaspoon of coconut oil to your pan and turn it back up to medium. While your pan and oil are heating up, add your other filling items on top of the eggs but only on one half of the tortilla. Once your pan and oil are hot, slide the flat tortilla into the pan. Let it sit for about 10 seconds, then fold the “blank” side over the filled side and press down. The “blank” side isn’t totally empty because your big flat egg thingy is all over the tortilla. This is a great way to get egg in every bite while allowing the tortilla to be as compressed as possible so all the filling items get warmed up and melded together. Let it cook for about 2-3 minutes until it gets golden brown on the bottom. Then it’s time to flip it. 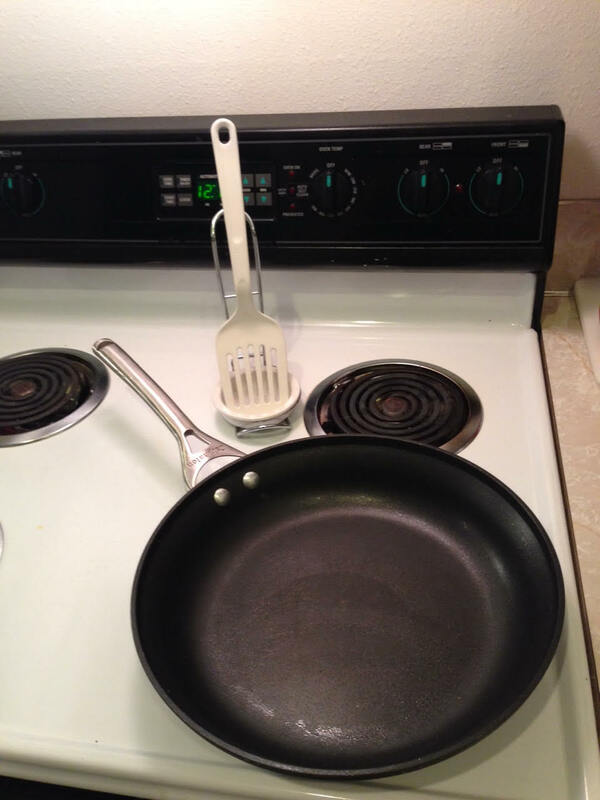 Use your big spatula and flip it as carefully as you can so not too many filling items go flying across your stove. If some do, just stuff ’em back in. Remember, the tortilla hides a multitude of sins. Let it cook on this side for about 2 minutes. 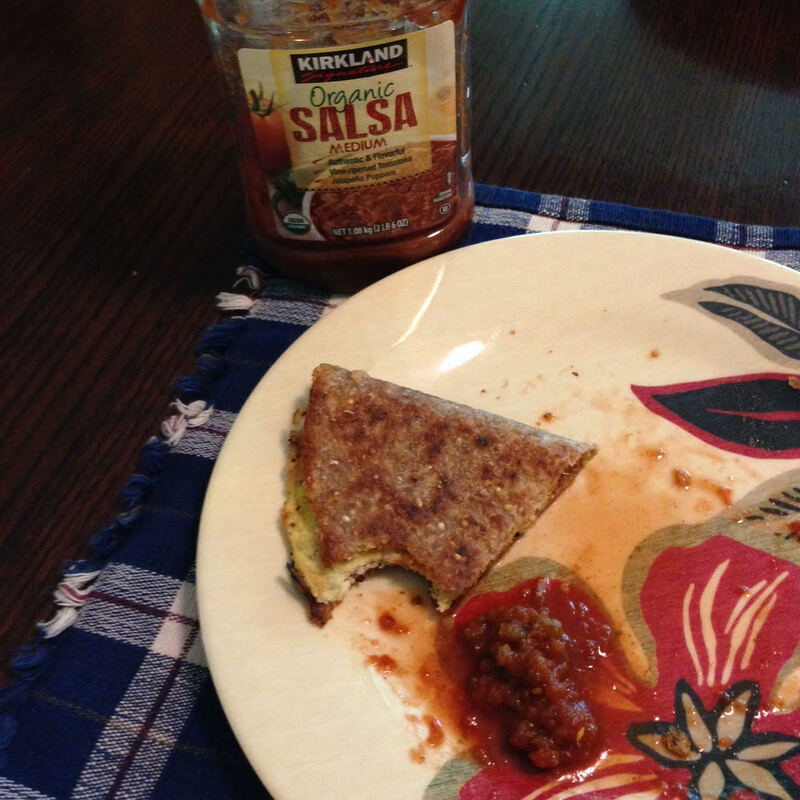 Slide your quesadilla onto a cutting board and cut it into quarters or thirds. Slide it onto a plate and well, eat it! I apologize that there aren’t more pictures of each step. I was moving pretty fast because I was hungry. I totally forgot to take pictures. Quesadillas are such a great way to use leftovers. They are also easy to customize for picky eaters in your household without feeling like a short-order cook. Let each person fill their own tortilla. Then let them be amazed at your fantastic quesadilla skills! If you have any questions about how this is done, ask me in the comment section. I’m happy to help you become a Quesadilla Master! 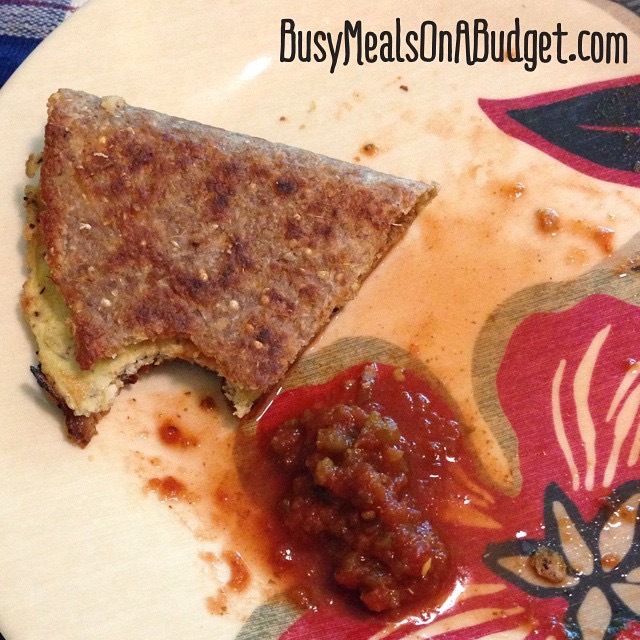 This entry was posted in Food, Fun, Healthy, Homemade, Ingredients, Recipes and tagged breakfast, chicken, coconut oil, customize, dinner, eggs, family, Fun, healthy, homemade, Ingredients, lunch, quesadilla, Recipe, Recipes, salsa, short-order, skillet, versatile. Bookmark the permalink.